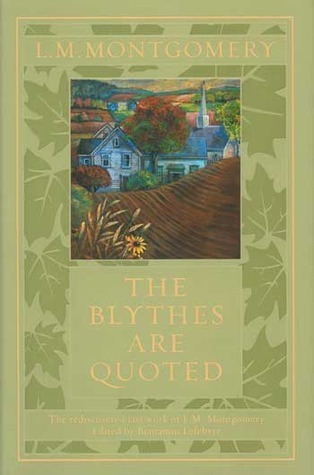 The Blythes are Quoted, the last book in the Anne series, is a short story collection made up of stories about people who are the friends/neighbours/acquaintances of the Blythes. In every story the Blythes are mentioned or quoted, sometimes fondly, sometimes not-so-fondly. I would like to write everything about this book. I would love to tell you about each story and write a whole post just of quotes. But, for now, I will exert some will power and keep it short(ish). The stories are divided into two sections: before WWI and after WWI. The ones that take place after the war make mention of the grown Blythe children, and even take us beyond the time of Rilla of Ingleside. Alternating with the stories are poems written by Anne, and sometimes by her son Walter, followed by some discussion among the Ingleside folk. 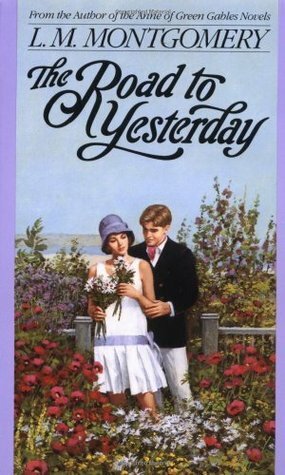 The Blythes are Quoted first existed as The Road to Yesterday, but had been edited at the time because of more ‘adult content’ in some of the stories. But, of course, the ‘adult content’ is one of the things that make this volume such a delicious read. In the first story alone, there are ghosts, dead kittens, an illegitimate child, a drowned child, and a suicide. Some of the darker themes in this collection include adultery, illegitimacy, despair, mysogyny, murder, revenge, hatred, and death. It also includes more familiar themes and topics such as orphans longing for good homes, marriages culminating after years of delay, and resolutions of past grievances or misunderstandings. And, of course, along with the delightful, you will find bits and pieces that will make you uncomfortable; a reminder of the times in which Montgomery wrote her stories. Even Gilbert himself (the love of my life) is heard to say, “She is one of those strong-minded women no man really cares for.” Eek. However, I don’t believe that because she writes it, she believes it to be true. I just think she writes it the way she sees it. … is it better to be beautiful when you are young and have it to remember always, even though it must be hard to see your good looks fade, than to be always plain and so have nothing much to regret when you grow old? … rosebud mouths were in fashion then. Who ever saw one now? … the sloping shoulders… they had gone out, too. The nurse had shoulders square as a man. Amy was simply heartbroken when the engagement to Elmer was broken off… It was really indelicate the way she snapped D’Arcy up the moment Elmer threw her over. D’Arcy isn’t much to look at… his face is too long… but poor Rhea looks quite as well as the other bridesmaids. That shade of blue is so trying… probably Evelyn selected it for that reason. Marnie looks like a gypsy as usual… only gypsies aren’t quite so plump, are they? Amy will find it even harder to get her settled than Evelyn. Diana Blythe looks rather well. There really is something about those Blythe girls… though I’d never admit it to their mother. Women should not put up with everything and that I will tie to. If you don’t get married you wish you had… and if you do you wish you hadn’t. She seemed like the child of twilight. Grey things and starriness were of her. She moved gently and laughed seldom but her little air of sadness was beautiful and bewitching. The old house seemed listening to the cold poison of her words. At times the gust of wind died away, too, as if the whole world wanted to listen. And don’t be too hard in your judgments of folks you don’t know much about. Perhaps Montgomery intended this last story of Anne to be her farewell letter to a world she knew she was leaving soon. Perhaps this is why so many of the pieces are preoccupied with finding, feeling, speaking truth and why Montgomery is at pains to show there is seldom one truth only. Montgomery the artist triumphs in shaping this final book: there is no easy closure for Anne’s story, and we care how and why this is so. Highly recommended for anyone who is a fan of L.M. Montgomery. And, just a reminder, we’ll be starting the Emily Readalong (#ReadingEmily) in February with the first book – Emily of New Moon. Join us! I had no idea this book existed! I thought the story stopped with “Rilla.” You’re right, it sounds like a must-read for a Montgomery fan. I’ll have to seek out a secondhand copy. I didn’t know about the existence of this book! I will have to see if I can find it! I hope you can find a copy! I really should have re-read this when we did the Anne Readalong. I hadn’t thought much about when this was written in terms of Montgomery’s life. Makes sense that she had some last thoughts she wanted to share with her readers. I’m excited to finally get to read the Emily books! I’m excited for you to read Emily for the first time! Can’t wait! Have you read a biography about her? If not, I recommend The Gift of Wings by Mary Henley Rubio. Gives a really great idea of where her head was at. Will probably be really illuminating right after reading her work. I do have that book! I read the PEI years after our Green Gables readalong, but haven’t read anymore since. Maybe I’ll be ready to read more after Emily! I know! Anything but the kittens, right? You’ll get the drowned kittens overwith in the first story. But I wouldn’t advise skipping that one – it’s the most ‘mysterious’ of the stories! The first story really stuck with me, too; I think they made a fine choice with which to begin the collection. Funny, I’m never very keen to pick up her stoies – they are often rather formulaid – but once I start reading them, I nearly always enjoy them. Here, I especially liked the imagined dialogue, which somehow felt like a peek into the author’s mind as much as Anne’s. I also imagine I’m learning a lot about LMM’s views on things through her characters’ dialogue. And sometimes it seems as though she’s having such fun with it – even getting to say things she wouldn’t say in her own life. And I agree about her stories seeming to be formulaic at times, but there must be something about them, because I gobble them up! I did not know about this book. I thought the Anne stories ended with Rilla and Christmas with Anne. I am glad to know there are more to explore. I had no idea this book existed – I can’t wait to read it. I’d love to have a look back at Anne’s life and legacy from all these different perspectives. I thought I’d read all of the Anne books, but I definitely missed this one! It sounds fascinating. I highly recommend it to any fan! I’d heard of this book, but dismissed it as a sort of hodgepodge that didn’t seem really part of the Anne world. However, it sounds more interesting than I had thought. I like how you describe that Montgomery was trying to show there is never only one truth. That seems important to keep in mind right now. If you are a fan of her work, then I’m pretty sure these stories won’t disappoint you. They’re an interesting mix! Glad you enjoyed the book, Naomi! The edition from 2009 can be hard to find now, but a new edition is coming out this October from Penguin Canada Modern Classics. Thanks so much for visiting and letting us know about the new edition! It has to be terribly interesting to go into the homes of nearby neighbors and hear what they think of Anne’s family. Mostly, LMM has us follow the minister’s children or Anne’s children, and they’re never the type to say a bad thing about the Blythes. I shall have to read this book for sure, Naomi! I also like it when LMM gets a bit darker. I bought her two novels for adults and need to read them. I think you’d like this one, Melanie. I thought it was so much fun to hear what others thought of the Blythes! And, the stories themselves, even without mention of Anne’s family, are wonderful. The more I read in the Green Gables books, the more I realized it wasn’t Anne Shirley I loved to pieces, it was Montgomery’s writing, so I DO think I will enjoy this one!